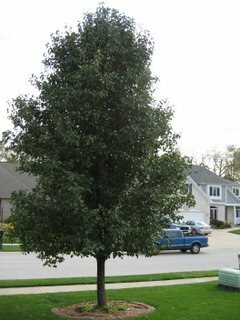 My neighbors on each side each have a flowering pear tree (Pyrus calleryana) in their front yards. I’ve noticed significant differences in them, so I took pictures of them the other day. One has dark red foliage now and a more rounded shape. The other pear tree, which I helped select and plant, is the variety ‘Cleveland Select’ . It is still as green as can be. If it behaves the way it has in other years, the leaves will change colors slowly and drop all the way through Christmas. Then they just kind of blow away all winter. The other odd thing about the neighbor’s unnamed variety of flowering pear tree is there are a couple of branches where the leaves haven’t changed colors at all. You can see them in the picture. Wonder why? Perhaps the tree is under some kind of stress? It leans a bit, so they’ve got a wire attached to it to try to pull it back upright. I think for this large of a tree, they won’t have too much success. It has had wires pulling on it for several years now, without much movement. 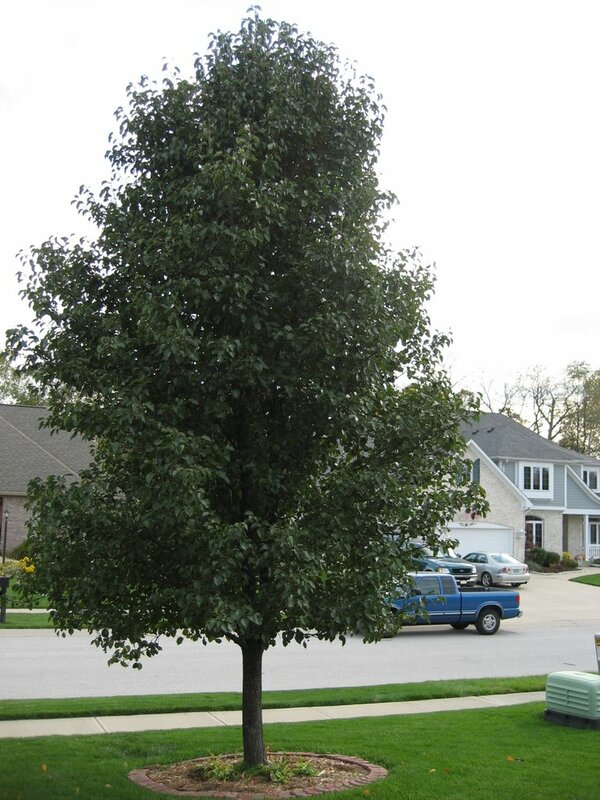 The other tree (‘Cleveland Select’) has a good shape tree shape with no pruning. It flowers nicely in the spring, though you don’t want to get too close, as pear trees are not known for their flower fragrance. Well, actually, they are known for their fragrance, but not in a good way. It’s kind of a funny, odd smell, but it only lasts for a few days. It does make a difference which variety of pear tree you plant! it has already finished blooming and started putting out the leaves. Mine is still bare with no sign of any foliage coming thru. Im waiting for a sign of life in it. Just wondering if anyone has experienced this problem? 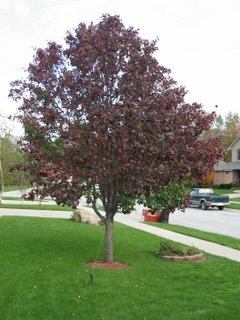 I'm having the same issue with one of three trees that are about 6 years in age and have been planted at the same time and within the same location. Two have fully came into leaves this spring but the third hasn't. The limbs have what look like small buds that are vey dried out. One thing was that this tree held it's dried leaves all winter and they fell off in the spring. The other two trees seemed to have what i would consider a standard drop of it's leaves in the fall and budded just like the third barren tree. I hope that someone can give some advice as to if this tree an be saved or is it a lost couse and be removed? I have the same problem with my Cleveland pear.....had semi-pretty buds just before last freeze. Now nothing....but tree is alive. No foliage or any signs of growth???? ?